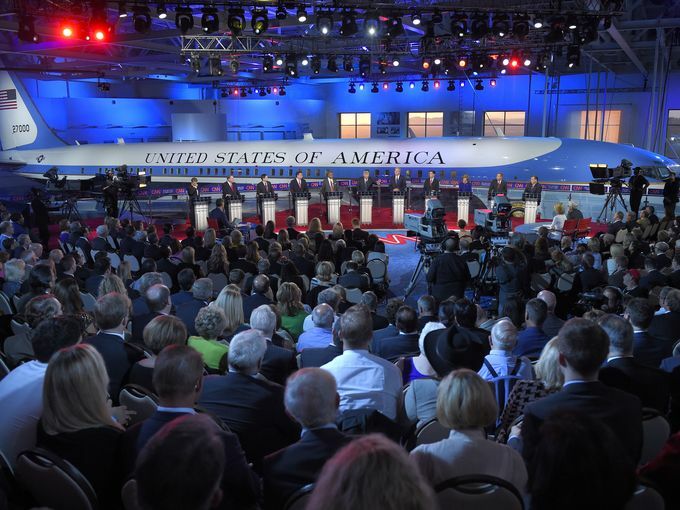 It’s still thirteen and a half months away, but with the way it’s being covered – and with the ratings that CNN scored last week when it hosted the second of the Republican primary presidential debates – you’d think the presidential election of 2016 was right around the corner. As we rush headlong into another presidential election cycle, we see all the typical trappings of what have become nothing short of political and journalistic rituals. We have a conservative action group that has launched a set of attack ads against Republican frontrunner Donald Trump. On the Democratic side, controversy has boiled over concerning the relative dearth of Democratic primary debates as compared to the number of Republican primary debates and how this favors Democratic frontrunner Hillary Clinton. As for the media, they are busy fact checking everything every candidate says. And then there are the rallies – the never ending rallies in every state and in what seems to be every American city. Rallies, of course, are great when a politician wants to solidify his or her base of supporters. Rallies also incite and excite a candidate’s supporters to vote. Rallies, in a democratic election system like ours, are necessities. Unfortunately, in our culture, we have taken what works well during an election cycle and have applied it, without much critical thought, to many different areas of life, including in our use of social media. Many of the posts I see on social media are meant to rally people who agree with one point of view by belittling and demeaning those who hold a differing point of view. Such posts follow a predictable pattern. First, an article, a meme, or even an out and out diatribe is posted that espouses the utter rightness of one point of view while attacking those who hold an opposing point of view as nothing less than reprobates. Second, people “pile on,” as it were, by posting comments. Third, anyone who dares to disagree with the view expressed in the initial post by posting a critical comment is harangued and attacked. Finally, nothing changes. People who agree with the sentiment expressed in the initial post still agree. And people who disagree still disagree. When posting on social media, it is time for us to start asking ourselves a question: in this post, am I trying to rally people or persuade them? The goal of persuasion is, in its strictest sense, to change someone’s mind on a particular position. In a broader sense, persuasion can also seek to engender empathy from someone who disagrees with a particular position. Even if someone does not agree with me on a particular position, I still deeply appreciate it when they at least understand why I think what I think, just as, I assume, other people appreciate it when I understand why they think what they think. The trouble with persuading people is that it is much more difficult than rallying them. Rallying people usually only needs a stake in the ground and a line in the sand. Persuading people often needs tortured, lengthy nuanced arguments about a particular position. Rallying people can make a person feel good because, when others express agreement with a particular point, the rallier is quickly assured that he or she is not alone. Persuading people can often feel much lonelier because it does not provide a common enemy against whom you and those who agree with you can join forces, but it also does not provide the kind of toleration and capitulation that your opponents might ultimately desire. Rallying people can be done in minutes. After all, social media posts can go viral in nearly no time at all. Persuading people takes relationship building, trust, and, usually, hours, months, and even years worth of conversations. And even then, sometimes, people remain unpersuaded. All this is to say that I can see the appeal of rallying people around a particular position. And, at times, rallies are necessary and desirable – especially in the face of a heinous evil that will not be persuaded, so it must be defeated. The problem is, as a long-range strategy, rallying doesn’t solve much. It may engender excitement and incite anger. It may get out a vote to defeat an opponent. But it doesn’t change a heart. We, as Christians, believe there are certain things the world needs to believe. We want the world to be persuaded to believe these things. Thus, particularly as we post on issues that have to do with our faith, we need to eschew the easy way of the rally and instead choose the harder way of persuasion. After all, eternal truth is at stake. And, in many instances, so are people’s souls. So think before you post. As Christians, we don’t want to just lambast those who might disagree with us, we want to show, with nuanced and thoughtful compassion, why people can, and should, agree with Christ. After all, Christ has persuaded us. Why would we want to do anything less than persuade others? Entry filed under: Devotional Thoughts. Tags: Christianity, CNN, Faith, Jesus, Persuasion, Rallies, Rallying, Republican Debates.